Metallic or elemental mercury (Hg°) is a heavy, silvery liquid (Fig 9.13) which is per se non-toxic, but vapourises at room temperature to give off a toxic vapour: mercuric mercury. 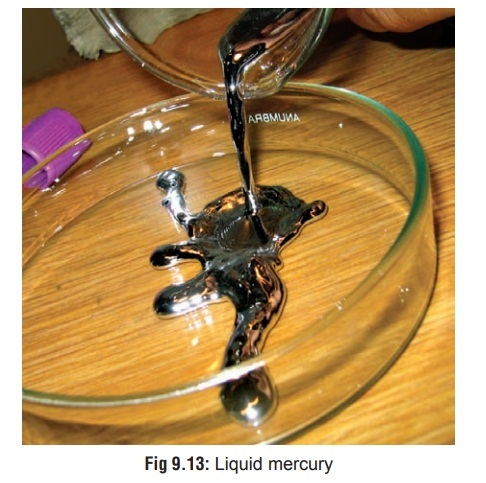 · Metallic or elemental mercury (Hg°) is a heavy, silvery liquid (Fig 9.13) which is per se non-toxic, but vapourises at room temperature to give off a toxic vapour: mercuric mercury. Volatilisation is greatly enhanced by heating. In its solid state, mercury is a tin-white, ductile metal that is malleable enough to be cut with a knife. · Salts or compounds of mercury may be inorganic or organic in nature. Inorganic salts are of two types—mercuric (bivalent, i.e. Hg++ ) and mercurous (monovalent, i.e. Hg+) . Common mercuric salts include mercuric chloride (corrosive sublimate) which is a white crystalline corrosive powder, mercuric oxide which is a red crystalline powder that turns yellow when treated with caustic soda or potash, and mercuric sulfide (vermilion or sindoor) which is a red crystalline powder. The most importantmercurous salt is mercurous chloride (calomel) which is fibrous and heavy. · Organic mercurials are generally more toxic and comprise mainly compounds such as phenyl and methoxymethyl mercury, and alkyl compounds such as ethyl and methyl mercury. Mercurochrome is also an organic mercurial and exists as iridescent green scales readily soluble in water. The most toxic compound of mercury is methyl mercury. · Listed in Table 9.6. · Breaking of mercury fluorescent light bulbs, heating of Uses/Sources mercury-gold amalgams in order to extract gold, and the use of mercury-containing latex paint or building materials.Ingestion or handling of liquid mercury following breakage of thermometers or other mercury-containing devices. · Insertion or removal of dental amalgam restorations can generate mercury vapour or respirable particulates. Bruxism, chewing, and tooth brushing may increase amalgam release of mercury vapour. · Occupations which have the greatest exposure to mercury vapours include mining and processing of cinnabar ore, the chloralkali industry, and occupations in which mercury- containing instruments or materials are manufactured or handled. · Dietary exposure to mercury (in the form of methyl mercury) from consumption of fish, shellfish and marine mammals. ■■ The amount of ingested mercury that would be fatal to a man is estimated at 100 grams. After inhalation, elemental mercury is readily absorbed through the alveolar membrane and enters the blood stream. Ingestion of mercury salts is asociated with slower rate of absorption. Mercury is rapidly converted to mercuric ions (Hg++) in the blood which can lead to renal tubular damage during excre-tion. In the central nervous system, mercury acts mainly upon cerebellum, temporal lobe, basal ganglia, and corpus callosum. Both organic and inorganic mercurials can be absorbed through intact skin. -- This usually occurs while heating metal in a closed room, or following gold refining in an enclosed area. -- Symptoms (which may be delayed upto 4 hrs) include dyspnoea, cough, fever, headache, chills, GI disturbances, metallic taste, and blur-ring of vision. Stomatitis, swelling of the sali-vary glands and gingivitis may develop within a few days of acute exposure to mercury. Teeth may become loose due to gum inflammation. -- In severe cases there may be non-cardiogenic pulmonary oedema, dyspnoea, convulsions, etc. -- Sometimes manifestations similar to Kawasakidisease (mucocutaneous lymph node syndrome)are seen especially in children, which may be mistaken for scarlet fever: conjunctival congestion, fever, reddened palms and soles. -- Small quantities of elemental mercury usually cause no harm on ingestion. Sometimes even a relatively large amount may pass out of the body uneventfully (egged on by a mild laxative). It is however advisable to take x-rays to monitor the progress of the elemental mercury through the GI tract. -- Ingestion of mercuric salts produces corrosion leading to abdominal pain, vomiting, diarrhoea, and shock. The mucosa of the GI tract usually appears greyish. There may be haematemesis. In severe cases there is onset of renal failure, pulmonary oedema, and coma. Urine may appear pinkish. -- Ingestion of button (or disc) batteries (Fig 9.16) poses special problems since they contain a variety of caustic substances apart from mercury. These batteries are used in hearing aids, watches, calculators, and some hand- held computer games. They range in size from 7 to 25 mm and can easily be swallowed by children. Each such battery contains a heavy metal (usually mercury) along with a variety of caustic alkalies, espe-cially sodium or potassium hydroxide. »» In the majority of cases of button battery ingestion there are no serious consequences, and the object usually passes out in the stools quite uneventfully over a period of 1 to 4 days, However if the contents of the battery leak out during transit, there can be production of burns by the caustic alkalies, and a theoretical risk of mercury poisoning (so far unreported). ⌂⌂ Airway assessment and stabilisation. ⌂⌂ Antero-posterior and lateral chest radio-graphs that visualise the neck, chest, and abdomen. ⌂⌂ Patients with batteries in the airway or lower respiratory tract require emer-gency removal via bronchoscopy. ⌂⌂ If the battey is visualised in the oesoph-agus, it requires immediate endoscopic removal by forceps or magnet. ⌂⌂ Intact batteries located past the stomach in asymptomatic patients can be followed up by serial stool examina-tions, checking for battery passage. ⌂⌂ If the battery fails to pass the pyloric region within 48 hours, endoscopic retrieval may be necessary. ⌂⌂ The use of polyethylene glycol solution in whole bowel irrigation can be consid-ered in patients with poor mobility of batteries in the GI tract. · Subcutaneous or intramuscular injections of elemental mercury may cause abscess forma-tion wih ulceration, extruding tiny droplets of mercury. · Intravenous injection can result in mercu-rialism characterised by thrombophlebitis,granuloma formation, and pulmonary embo-lism. Repeated haemoptysis is a characteristic feature. · Intra-arterial injection can result inadvertently from arterial blood gas sampling with syringes which contain liquid mercury as an anaerobic seal, or from arterial pressure monitors which employ a liquid mercury manometer connected directly to the intra-arteial needle. Leakage of mecury into arterial blood results in peripheral embolisation with ischaemia, and sometimes frank gangrene. There may also be abscess formation and ulceration. X-ray usually reveals multiple, tiny spheres in the veins draining the entry site. Mercury globules may also be seen in various organs. -- Tremor: It is one of the classical and most consistent manifestations of chronic mercury poisoning and is sometimes referred to as the Danbury tremor. It begins in the hands and isof a coarse, intentional type, interspersed with jerky movements. Later it progresses to the lips, tongue, arms, and legs. The advanced condition is referred to as Hatter’s shakes,* when the tremor becomes so severe that daily activities involving some delicacy of movement become grossly impaired, e.g. shaving, writing, holding a tumbler or spoon, etc. The most severe form of the condition is referred to as concussio mercu-rialis when literally no activity is possible. Evenyears after exposure to mercury has ceased, tremor may persist. -- Ataxia, reeling gait. Fasciculations of the tongue and legs have been reported in paediatricpatients after several months of exposure to elemental mercury. -- A Parkinsonian syndrome with resting and intention tremor, bradykinesia and cogwheel rigidity has been reported after long-term exposure to elemental mercury vapours. The syndrome improved after penicillamine chela-tion. -- Metallic taste (Table 9.7), anorexia, nausea, increased salivation. -- Gingivitis, halitosis, blue line on gums (similar to the Burtonian line of plumbism). -- Erythematous macular or papular rashes are common with mercury vapour poisoning. The rash usually involves the hands and feet. The trunk, axillae, popliteal and antecubital fossae may also be affected. -- Mercuria lentis: Characterised by the brown reflex of anterior lens capsule of the eye. There may be fine punctate opacities. Visual blur- ring is often present, and sometimes there is concentric constriction of visual fields (“tunnel vision”). Mercuria lentis usually indicates chronic exposure to elemental mercury rather than toxicity. Diagnosis is made by slit lamp examination. -- Renal damage results in membranous glomerulonephritis with hyaline casts and fatty casts in the urine. It is more common in chronic ingestion of mercury salts. Acrodynia (Pink disease) (Fig 9.17): This is seen mainly in children. Formerly most cases were related to chronic use of teething powders containing mercurous chloride. But almost any form of chronic mercury exposure can cause this condition including inhalation of elemental mercury vapour or cutaneous application of ammoniated mercury ointments. The onset is usually insidious with anorexia, insomnia, profuse sweating, skin rash, and photophobia. The hands and feet become puffy, pinkish, painful, paraesthetic, perspiring and peeling (the child pees!). Teeth may be shed, with ulcerationof gums. In older children and adults the disease is milder, and is characterised by antisocial behaviour, insomnia, aching extremities, and alopecia. Today the incidence of childhood acrodynia is uncommon since the use of mercu-rial teething powders and diaper rinses has been abandoned. Exposure to mercury at an early age is suggested as a possible factor in the aetiology of autism, as per recent studies. According to these inves-tigators, the reported increased rates of autism in some Western countries over the last few decades could be associated with increased exposure to mercury through infant vaccines containing thimersol (also spelt thimerosal or thiomersal), dental amalgams, or RhoD immu-noglobulin injections that the mother received during pregnancy. · Features are related mainly to the CNS and include dysarthria, ataxia, paraesthesias, neuropathies, dimin-ished auditory and visual acuity, mental deterioration, and chorea. · A special type of organic mercurial poisoning relates to food poisoning through methyl mercury which has caused terrible tragedies in the past, and may well cause more havoc in the years to come, unless measures are devised to curb its far reaching effects. Between 1953 and 1970, on the island of Kyushu around Minimata Bay in Japan, more than 2000 people were diagnosed to be suffering from a curious cluster of neurological symp-toms comprising paraesthesiae, narrowing of vision, dysarthria, diminution of hearing, amnesia, ataxia, staggering gait, weakness, and emotional instability. Some developed paralysis and became stuporous, and out of all the people afflicted nearly a hundred died. The condition came to be known as the Minimata disease (Fig 9.18), and intensive investigations pointed to one inescapable conclusion: it was caused by consump-tion of fish contaminated with methyl mercury, which originated from a nearby vinyl chloride plant. The most severely affected victims were actually infants who had been exposed in utero. · In 1964, a similar outbreak of poisoning was reported from another part of Japan: Niigata along the Agano river. Forty three cases were diagnosed as having the Minimata disease out of whom six died. Then came the shocking tragedy in Iraq in 1971–72, when 500 people died out of a total of 6530 victims due to consumption of imported wheat and barley meant for sowing, treated with methyl mercury. Nearly 95,000 tonnes of seed grain treated with methyl mercury was baked into bread. · Unlike inorganic mercury compounds, methyl mercury is a subtle, difficult to detect, long lasting poison. When large quantities of industrial waste and agricultural fungicides containing mercury are released into the ocean apart from volcanic discharges, methyla-tion of this relatively inoffensive metal results in the production of methyl mercury which then enters the algae-fish-human food chain. This biological methyla-tion is accomplished by a deep sea bacterium called methanobacterium omelanskii . These bacteria areconsumed by plankton which in turn are eaten by fish. When human beings partake of such contaminated fish, the scene is set for a tragedy. · In the human body, methyl mercury is bound by haemoglobin and circulates in this form in the blood-stream for several weeks or months. Excretion is very slow and the estimated half life in man is 70 days, while in fish it is 200 days. It passes easily into the CNS where it selectively and irreversibly damages the cells of the granular layer of cerebellum and cerebral cortex. Methyl mercury is especially injurious to the CNS of infants and children. · Blood mercury level: Flameless atomic absorption spec-trometry is best for deducing this. Normal level is less than 3 mcg/100 ml. Symptoms of toxicity may occur at blood mercury concentrations of 5 mcg/100 ml or greater. Symptoms do not always correlate with blood mercury levels. · Urine mercury level: Urinary mercury is the best biolog-ical marker for chronic elemental or inorganic mercury exposure. Urinary mercury concentrations are also useful for assessing the response to chelation therapy. Normal level is less than 10 to 15 mcg/100 ml. Signs and symp-toms of toxicity may begin to occur at urinary mercury concentrations of 20 to 100 mcg/100 ml. Urinary mercury levels, however, often do not correlate with clinical signs and symptoms of toxicity. There is a high degree of intraindividual variation in urine mercury levels. The averaging of several urinary mercury determinations may be required. A 24-hour urine collection is recommended. · Hair analysis: Done by cold vapour atomic absorptionspectrometry. External contamination can however vitiate the results. -- In elemental mercury ingestion, take x-ray and repeat it to study the progression. If mercury gets lodged in the appendix, perform appen-dectomy. -- Demulcents for corrosive compounds such as mercuric chloride. -- Stomach wash: It may be advisable to add egg white or 5% albumin or just plain milk to the lavage fluid to bind the mercury. -- If there is abscess formation, perform repeated incisions to remove the mercury. If the globules are very minute and widely distributed in the intercellular spaces, excise the affected tissue. -- Monitor the CNS and renal functions for evidence of toxicity. -- Mercuric salts are relatively well adsorbed by activated charcoal. –– Chelation is not very effective. –– In severe manifestations with acute renal failure resulting from any type of exposure, the following may be tried: haemodialysis, haemofiltration, or plasma exchange. Haemoperfusion is said to be ineffective. -- 100 mg by deep IM, every 4 hours for 48 hours, followed by 100 mg every 8 hours for 8 to 10 days. -- 5 mg/kg IV, or 6 infusions of 250 mg/day, followed by 100 mg orally twice a day for 24 days. --30 mg/kg/day orally for 5 days, followed by 20 mg/day for 14 days. -- 250 mg qid, for adults, (20 mg/kg/day) for 5 to 10 days. · In death due to acute mercury poisoning, the mucosa of the mouth, throat, oesophagus, and stomach appears greyish in colour with softening and superficial corrosion. There may be haemorrhagic points. · If there had been survival for a few days, the large intestine may reveal ulceration. · Kidneys are often pale and swollen due to oedema of renal cortex. Microscopy usually demonstrates necrotic changes in the renal tubules. · Mercury and its compounds constitute important industrial, agricultural, and occupational toxic hazards. In the past when mercury was used in its various forms for the therapy of a wide variety of ailments including syphilis, iatrogenic poisoning was common. Even today calomel (mercurous chloride) is sometimes recommended as a laxative. Prolonged use can cause colitis dementia, tremor, and renal failure. Acrodynia resulting from teething powders containing calomel has fortunately become a rarity. · The tragic consequences of chronic industrial exposure to mercury have been outlined in the foregoing sections. Domestic exposure though not often reported is today a distinct threat. Such exposure may result from inadvertent mercury spills (broken thermometers), or from home gold- ore processing. · An important area that must be considered in relation to chronic mercury exposure is dentistry. Dental amalgams used for fillings often contain mercury. Dental surgeons may get chronically exposed due to this reason. Many dentists still knead the amalgam mass in the palms of their hands. In squeezing the mass to express excess mercury, droplets of the metal sometimes fall to the floor where they are allowed to remain and vapourise. Significant concentrations may be detectable even in the reception room environ-ment. Recent studies of mercury levels in dental surgeons suggest that they are at high-risk for developing mercury related polyneuropathies, psychopathies, and visual distur- bances. However patients wih mercury amalgam fillings are not at risk even though such fillings may remain intact for years. · Food poisoning (especially involving fish) through mercury compounds can give rise to manifestations akin to the Minimata disease. · A relatively new hazard concerns dry cell batteries used in cameras, hearing aids, torches, and watches.